I think Charlie has caught the crafting bug. Little Man loves anything to do with superheroes, and so, inspired by the Avengers movie, Charlie decided to make a Thor helmet for him. To make the helmet, first thing you need to do is blow up the balloon so that it is approximately the same circumference as your child’s head. Then coat strips of newspaper with wallpaper paste, and layer them on to the balloon, covering it in a roughly helmet shape. We made it longer at the back, and shorter at the front. Don’t worry about the edges at this stage, because you can trim those once the papier maché is dry. 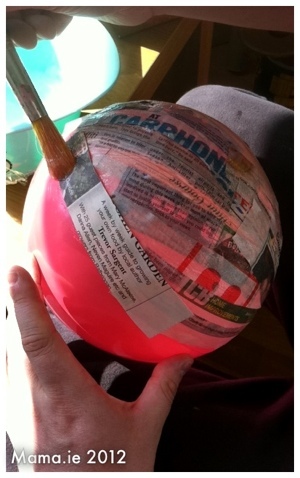 Once you have about three layers of newspaper on the ballon, set it aside to dry. Ours dried overnight, but the weather was quite warm. You may need to leave it 48 hours to dry completely. Once it’s dry, pop the balloon, and then use a scissors to trim the edges to make your helmet shape. 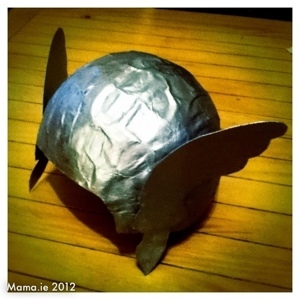 On a separate piece of cardboard, cut out two feather shapes, and stick them to the sides of the helmet. Wait a little longer for the glue to dry, and then paint the entire helmet. We used silver acrylic paint, and it took two coats to cover it completely. Little Man absolutely loves this helmet. He now has a foam Thor hammer to go with it – watch out baddies! Thor’s here!